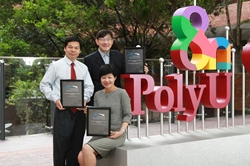 The Hong Kong Polytechnic University (PolyU) has brought glory to Hong Kong by winning three Global Innovation Awards at the TechConnect World Conference and Expo 2017 (TechConnect World). It is the first time for a Hong Kong higher education institution to receive the award. PolyU is also the only awardee from Hong Kong. The annual TechConnect World held in the US aims for supporting the development and commercialization of innovations. For years, it has been providing an international platform for research laboratories and universities to exchange and collaborate with the industry sector, and has become the largest multi-sector signature event of its kind in the world. This year, the event gathers more than 4,000 technology innovators, ventures, industrial partners and investors from over 70 countries. TechConnect World only grants awards to the top 20% of innovations submitted, with assessment based on the potential positive impact the submitted technology will have on a specific industry sector. This year, 26 global awards are presented to non-US-federal-funded innovations across the world. Another 60 national awards are granted to innovations with US federal funding. The awardees include a number of global-renowned research institutes, such as NASA, US Department of Energy, National Labs, Berkeley National Lab, Princeton Lab, UCLA, Georgia Tech, University of Melbourne, etc. The PolyU delegation received the awards at the TechConnect World event held in Washington, D.C. from 15 to 17 May. They also showcased 11 innovation projects at the PolyU booth at the expo. Besides attending various exchange sessions with members from the industry, government and academia sectors around the world, PolyU delegates also explored product development and cooperation opportunities with executives from Fortune Listed top multinational corporations, including Eastman, Henkel, Ingersoll Rand, Saint Gobain, etc. The “multi-functional nano-coating for glass” project conducted by Dr Lin LU has received keep responses from renowned multinational companies which indicated intention for collaborating with PolyU in further research and project development. In their meeting with PolyU delegates, many corporation leaders indicated that collaborating with institutions that develop cutting-edge technologies is an integral part of their innovation strategy. They believed that combining PolyU’s unique technologies with corporations’ global market access would help generate mutual benefits in the future.